Download and install the Zadig drivers if this is the first time you have have used your RTL2832U stick. You will need 7zip to extract the files. When finished extracting you will see an Zadig.exe file. Plug in your RTL2832U stick. Be sure to do a list all devices in the optiond menu to see your stick. This will usually be a bulk-in, interface (interface 0) device, or it could just say RTL2832. Once selected proceed to install the driver. Note:If you are switching to a newer R820T based stick, it would be a good idea to upgrade your Zadig drivers anyway. Download the new ExtIO.dll for RTL2832U devices. Unzip, look in the folder labeled Release and copy the file ExtIO_RTL.dll to the directory where you installed HDSDR. Start HDSDR. If ExtIO_RTL.dll is the only ExtIO.dll file, HDSDR will start immediately. If you have an additional ExtIO file in the directory from a previous install, you will get a file manager page first. You should then select the ExtIO_RTL.dll and you are good to go. One little strangeness, is that if you start HDSDR tuned to a frequency that you RTL2832U does not support, you will get a “Pll Not Locked” popup message. Just ignore it and tune HDSDR to a supported frequency and the message will go away. The author has since corrected this problem. 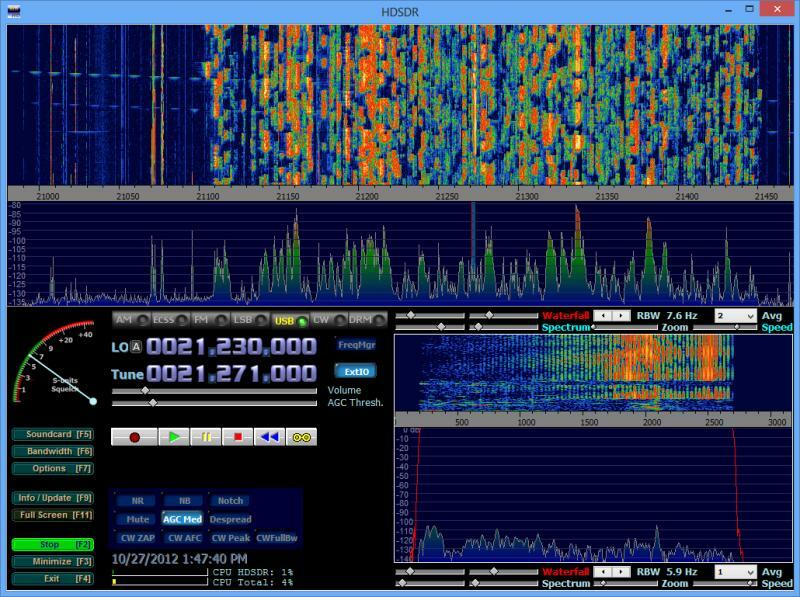 Once HDSDR is going click on the ExtIO button next to the frequency display. This will bring up the ExtIO control panel. Here you set the gain of you RTL2832U stick for best performance. This very important, because if it’s too low, you won’t receive much. However, if it’s too high, you will get more noise, RFI, Front end overload, and reduced sensitivity. It’s best to experiment with these settings a bit to see what works best with your stick and antenna. Thats pretty much it. Simpler and better performance in my opinion. Note – For those who are getting the ExtIO.dll not active message, this because you do not have the Zadig driver properly installed for your RTL2832U. If you move the RTL2832U from a previously installed usb port to a different usb port, you will have to reinstall the Zadig driver for that port. I have tested this for a while and it work super exept for that i dont know how to fix the +6 Khz off frequency i have. It was easy in SDRsharp to change the ppm but i cant seem to adjust the frequency in HDSDR so its at the right frequency using the calibration in the menu. Can anyone give me a hint on how to do? Using the latest extIO_RTL.dll and rtlsdr.dll in HDSDR you should see the ExtIO button illuminated. a double left click takes you to the gain/AGC selections and a right click opens the freq adjust window. I had the same “not active” problem. Then I found that the driver for the 2nd bulk-in interface was libusb. ExtIO_RTL.dll has been working just fine for both HDSDR and Winrad. Thanks for reply but very soon after I posted I found a link on ebay for a new version of SDR spharp and it works very well great reception of 12 and 10m bands plus US Emergency stuff via F2 prop…really would like it work under OSX Lion though, is there a driver for this I wonder anyone ?? I don’t think there are any easy to install programs for OSX, however if you google around some, apparently some folks have gotten it to work. If you are running into problems with this ExtIO, you may want to keep checking back with the development site. The author seems to be updating it regularly. Just got my RTL2832U and it doesn’t seem to receive much. Even nearby FM broadcast stations are not very strong. I even tried a 75M dipole and it didn’t improve the HF signals. The frequency selection seems to freeze too. I can select the 1 MHz digit and it works for a while then will only rock back and forth 2 Mhz. Which chipset did you get? The first stick I tried was pretty deaf also even though it listed a RTL2832U/E4000 chipset. Quality control is not always the best with some of these sticks, so you could have a bad one. Also sometimes the ESD protection is not installed and connecting an external antenna can damage the device. Try to return it if you can. I prefer to deal with NooElec as a vendor since they are specializing in these type of devices. Yes I bought mine from NooElec. Why does the tuning freeze? I can used my mouse wheel to change the frequency then nothing happens. The problem you are having can be caused by either too much RF noise coming up the USB line or a bad antenna connection or crappy antenna, or both. More often than not it is both. The antenna that comes with the dongles is worthless and you also should not try to make it into an adaptor because as you will find when you slice into the “cable” it is not coaxial cable at all, just shielded audio wire, if that. If you have a MCX, try to put an adaptor on it and then leave it connected, dont plug it in and take it out, they are not meant for frequent connection and disconnections. If you have a Beiling Lee, the easiest is to use a Beiling Lee to F connector adaptor and then use F connectors and CATV coax, trying to keep the runs short as possible. The dongles have 75 ohm RF inputs. You can use RG6. It is pretty decent considering its low cost. Avoid the thin coax except for extremely short patch cables. It will eat up your high frequency signals. First of all, if you think you may have a bad one, drop NooElec an email http://www.nooelec.com/store/contacts/ they seem to be very helpful. You did not mention which software you are using. I would suggest trying SDR Sharp if you have not already. Also, if you are using the ExtIO mentioned in this article, which still has a few bugs. Be sure to read SDR Sharps installation information carefully. Normally SDR Sharp is very reliable with these RTL2832U sticks. The Zadig installation triggered Norton-AV. Can I safely assume this is a false positive? If you downloaded Zadig from the source, it shouldn’t be a problem. You should check the md5sum against the original source. Make sure you get files from their original source. Don’t get them from third party entities. Yes, some files especially ones from third parties, could contain viruses, of course. I’m having a major problem getting this installation to work. When I first tried it, it worked and read the RTL2832U stick properly. The next time I turned the computer on, it returned the ExtIO-DDL not active error. I have not been able to get it to work again, even after uninstalling everything and reinstalling again. Head over to https://github.com/josemariaaraujo/ExtIO_RTL and submit an issue. I have that the author is very good about replying. I had the same problem myself. I found a workaround: Right-click on the HDSDR icon and select “Run as Administrator”. If you want the settings to be persistent you check the run as administrator box located under the compatibility tab while in the shortcut properties. I will continue to look far a solution that does not require elevated privileges to run and post them here. Já tive o meu SDR a funcionar. Instelei tudo como aqui dizem, porem, agora nunca mais consegui receber. Qualquer frequencia que coloque, tenho sempre um Sinal S9, e mesmo com o radio ao lado a emitir não chega nada. I have been trying to follow the alternative instructions and have been unsuccessful. Can’t seem to get the Zadig menu only get files with extensions that are meaningless to me, like libwdi-1.2.2.tar.gz I have 7zip installed from a previous experiment but not sure libwidi and 7zip ever found each other. I assume libwidi is Zadig. I am running this on a windows 7 64bit. HDSDR is a windows 32bit program and runs as such on my PC. But the ExtIO_RTL.dll is compiled as w64 bit dll. So I get the error (ExtIO_RTL.dll is not a valid win32 application. HDSDR runs but if I click on the ExtIO button it informs me that it is not a valid Win32 application. Is there an older version of the ExtIO.dll compiled for win32 out there anywhere? I was running into many of the problems with the various EXTIO messages. To resolve this, I had to uninstall ALL of the various dll’s recognized by Windows 7 regarding the U2832. I had to do this 5 or 6 times and always selecting to “Delete the driver software for this device”. When I started, the device was recognized as a Realtek U2832 and the only program that I could get to work was SDR Console. Programs such as HDSDR and SDR# all kept complaining about being unable to use the device. Now the device is showing up as a pair of bulk interface devices. driver was install but how can find hf freq im try 7.1mhz but no function..if 57.1mhz bad recived.. I purchased a Soft66RTL2 including RTL2832u+R820T with 50MHz upconverter and have no success installing this with any software so far. There is a strong signal in the centre of the display and all I seem to receive is a loud Echoing sound. Nothing received even with a keyed transmission in the vicinity. I have turned the RF gain up and down with no difference. None of the setting associated with the program make any difference. any ideas? Sounds like whatever SDR software you are using is not detecting the RTL2832u and reverting to the computers internal mike for SDR input. If it is, you will see a large area in the center of the waterfall that will modulate if you tap on the computer. This usually caused by either the RTL2832u Zadig drivers not installed correctly, any additional files that the SDR program may need have not been placed into the proper directory, or simply the RTL2832u has not been selected as the input device within the SDR software. I had the same problem,Installed sdr with Upconverter and used about 3 metres of plain wire for the aerial. Exited Options and went back to main screen and then Clicked on EXTIO and enabled Tuner AGC and RTL AGC. I can’t get HDSDR to recognize the RTL device. In the instructions above they make it sound so easy. I’ve tried this probably ten times. When I extract the driver files,I don’t see the file Zadig.exe Is there somewhere I can find more in depth instructions on how to get the files extracted and find the Zadig.exe file etc.etc. Update: I’ve found a way to get around the “Windows has decided that windows knows what driver is best for you and your family” message.. When you update the driver, choose “let me find the driver on my computer” or words to that effect. Then choose “I have disc” or words to that effect. Just choose the folder where the driver is C:/Programs x86/HDSDR or words to that effect, instead of the cd player where you would’ve inserted the disc that you DON’T have. Do you know of a way around the USB 2.0 requirement for HDSDR software? My machine has only USB 3.0 Ports and the instructions say 2.0 is required. Greetings from India,thanx for keeping in touch with interesting & enlightening messages. I will have to check & tell U know. Info should be authentic. Hi I like to ask how to revert the change of the stick to the original state. Looking through Internet and still nothing. How to use the stick again for TV? thanx for keeping in touch with interesting & enlightening messages. Does anyone have a solution to the “No Compatible Devices Found” issue? I’ve been struggling with this for quite some time and I need a little guidance. Assuming you have the correct driver setup for the required USB Drivers in “Control Panel/Device Manager/Hardware for the USB ports labeled “Bulk IN 0” and “Bulk In 1” — I solved my problem : “No Compatible Devices Found” by using an OLD Version of SDR#. Once I loaded version 1.0.0.1135 of SDR# it started working. However, it still doesn’t provide the full frequency range of tuning (abt. 30 MHZ is as low as it will tune). Other features are also not available with version 1.0.0.1135. I’ll be trying other versions to see if it can be made to function as expected. Frank, Thanks for the response. Unfortunately, the driver issue won the war. I had to sell the whole bundle. The guy who turned me onto SDR tried to install the drivers and failed miserably. He’s installed dozens of these things in every operating system. He just couldn’t figure it out. He told me there was one other person who had the same problem, so, there are two of us!!! So, I got $40 for the whole package. At least I got some money back. I really wanted this to work. Maybe too much.. Oh well. On to the next adventure! Assuming I had the correct driver setup was what the instructions did as well. The instructions gave up on me.. These RTL sticks are so much fun. I have my RTL device working under Linux Mint with GQRX, it work really well and now have the DMR output from my FT-2000 feeding directly into the RTL device for a great PAN Adapter. Been trying to get HDSRD to work uner WINE in Linux, it installs fine but apparently HDSR cant utilise USB ports when running in a Linux environment so getting a EXTIO device not recognised message. Would be interested in hearing from anyone who has managed to get HDSRD working with an RTL device running under WINE in Linux? > I have my RTL device working under Linux Mint with GQRX, it work really well and now have the DMR output from my FT- 2000 feeding directly into the RTL device for a great PAN Adapter. I am looking to do the same thing, only with my TS-2000. I have the hardware necessary, but I’m curious as to how you set up GQRX to deal properly with the IF output of your radio. Is there a way to get GQRX to display the actual operating frequency instead of the IF frequency? Also, have you been able to get any real audio out from your setup? I tried listening to my own 2M FM signal and got nothing but crackle-pops. Here you can see in IF view of my FT-2000 on 6M. Here I’ve set the GQRX LNB LO to -19.300000 MHz. Sorry I wasted my money on it. Tried all the different ways to install and nothing. Missing this or missing that. Hi. I am trying to set up my Ft2000d with the RTL2832 dongle. When I click the blue EXtIO button it does not allow me to adjust tuner gain. It is currently stuck at 0.0db. Any suggestions. I have only white noise coming through the computer signals even when tuned to a strong local signal. Hello! I have bought that: http://www.ebay.de/itm/391499151958?_trksid=p2060353.m2749.l2649&ssPageName=STRK%3AMEBIDX%3AIT When I open HDSDR, i receve a message: No RTLSDR device found. My chipset is RTL2838UHIDIR. Is this a problem? I have one question. Is it possible to Tx in HDSDR with just the integrated Realtek audio device on my desktop? I’m running Windows 7 Home Premium 64-bit and the machine is an HP Pavilion p7-1012. 3.40GHz Dual-Core CPU/8GB of Ram. If it is possible, how do I setup HDSDR for Tx. If not, would you recommend a compatible sound card please? Cannot wait to use my computer to monitor the activity and individual signal strength on the 20 meter amateur band. What exactly do I need as software and hardware? Can I use the Macbook computer or do I need Windows?